Better methods for computer vision and object detection are among the innovations presented by CSE and other robotics researchers from UC San Diego at the 2017 International Conference on Intelligent Robots and Systems (IROS). The five-day conference ends September 28 in Vancouver, British Columbia. IROS is one of the premier conferences in robotics," said CSE professor Henrik Christensen, director of the Contextual Robotics Institute at UC San Diego. "It is essential for our institute that we present key papers across manufacturing, materials, healthcare and autonomy. I am very pleased to see that we have a strong showing at this flagship conference." This year's conference focused on "friendly people, friendly robots." Robots and humans are becoming increasingly integrated in various application domains, according to conference organizers. "We work together in factories, hospitals and households, and share the road," organizers said. "This collaborative partnership of humans and robots gives rise to new technological challenges and significant research opportunities in developing friendly robots that can work effectively with, for, and around people." Better interactions between robots and people require improving computer vision, and researchers led by CSE Prof. Laurel Riek are proposing the use of depth information to do so in their paper at IROS. Riek is the senior author on a paper that introduces Salient Depth Partitioning(SDP), a depth-based region cropping algorithm devised to be easily adapted to existing detection algorithms. SDP is designed to give robots a better sense of visual attention,and to reduce the processing time of pedestrian detectors. In contrast to proposal generators, the team's algorithm generates sparse regions to combat image degradation caused by robot motion, making them more suitable for real-world operation. SDP is also able achieve real-time performance (77 frames per second) on a single processor without a graphics processing unit (GPU). "Our algorithm requires no training, and is designed to work with any pedestrian detection algorithm, provided that the input is in the form of a calibrated RGB-D image," according to the paper's abstract. "We tested our algorithm with four state-of-the-art pedestrian detectors (HOG and SVM, Aggregate Channel Features, Checkerboards, and R-CNN), and show that it improves computation time by up to 30%, with no discernible change in accuracy." pedestrian detectors by up to 30%, with no discernible change in accuracy. Prof. Cottrell is senior author on this paper spelling out a way to improve object-recognition processes. Active Object Recognition (AOR) has been approached as an unsupervised learning problem, in which optimal trajectories for object inspection are not known and to be discovered by reducing label uncertainty or training with reinforcement learning. Such approaches suffer from local optima and have no guarantees of the quality of their solution, according to the paper's abstract. " In this paper, we treat AOR as a Partially Observable Markov Decision Process (POMDP) and find near-optimal values and corresponding action-values of training data using Belief Tree Search (BTS) on the AOR belief Markov Decision Process (MDP)," say Cottrell and Ph.D. student Mohsen Malmir. "AOR then reduces to the problem of knowledge transfer from these action-values to the test set." The computer scientists trained a Long Short Term Memory (LSTM) network on these values to predict the best next action on the training set rollouts and experimentally show that their method generalizes well to explore novel objects and novel views of familiar objects with high accuracy. They also compare this supervised scheme against guided policy search, and show that the LSTM network reaches higher recognition accuracy compared to the guided policy search and guided Neurally Fitted Q-iteration. They further looked into optimizing the observation function to increase the total collected reward during active recognition. In AOR, the observation function is known only approximately, so they derived a gradient-based update for the observation function to increase the total expected reward. In doing so, they showed that "by optimizing the observation function and retraining the supervised LSTM network, the AOR performance on the test set improves significantly." Meanwhile, other Contextual Robotics Institute faculty members including ECE's Michael Yip and MAE's Michael Tolley also had papers presented at IROS 2017. Click here to read the full Jacobs School of Engineering news release. According to CSE assistant teaching professor Mia Minnes, who chairs the department's Lecturer recruiting committee this year, CSE has lined up a stellar group of lecturers to assume some of the undergraduate teaching on top of the courses taught by tenure-track and teaching professors as well as lecturers with "continuing" status: Rick Ord, Thomas Powell, Susan Marx and Gary Gillespie. Quang Bach is one of two new CSE lecturers this fall. We typically recruit several lecturers from industry to teach some specialized electives and graduate courses," said Minnes. "We also look for excellent teachers to help fill the large student demand for additional seats in our program." While most of this year's lecturers are returning to the department, at least two of them are newly hired for the 2017-2018 academic year. Quang Bach will be teaching CSE 21 (Mathematics for Algorithms and Systems Analysis) in the winter quarter, after completing his Ph.D. in Mathematics in 2017 at UC San Diego. Bach has taught multiple courses in Mathematics as well as UC San Diego's Summer Bridge program. The other newcomer, Hau Nguyen, will be teaching both CSE 8B (Introduction to Computer Science and Object-Oriented Programming) and CSE 100 (Advanced Data Structures) in the fall quarter. He previously worked at SPAWAR Systems Center and Teradata Labs, and Nguyen has taught for UC San Diego Extension, CSU San Marcos, National University, and San Diego Community Colleges. Several lecturers this year will be teaching more than one course. Isaac Chu will teach CSE 15L (Software Tools and Techniques) and CSE 131 (Compilers) this fall. Chu is a senior manager for web development at American Specialty Health. A UC San Diego alumnus, Chu (B.S., M.S. '94, '96) completed his degrees in Computer Engineering. Miles Jones will be teaching CSE 21 (Mathematics for Algorithms and Systems Analysis) and CSE 101 (Introduction to Algorithms) in the fall quarter. He has been teaching both these courses for several years, after completing his Ph.D. in Math in 2012 at UC San Diego. Likewise, Phil Papadopoulos will be teaching two courses -- CSE 160 (Introduction to Parallel Computing) and CSE 12 (Data Structures and Object-Oriented Programming) -- later this academic year. He is the Program Director for UC Computing Systems and a researcher at SDSC, and also received a UC San Diego B.A. degree in 1985 (before going on to complete his Ph.D. at UC Santa Barbara. One of Papadopoulos's colleagues at SDSC, Chief Data Science Officer Ilkay Altintas, will be teaching CSE 15L (Software Tools and Techniques Lab) in the fall. Altintas also advises numerous CSE undergraduates in research projects underway at SDSC, where she directs the Center of Excellence in Workflows for Data Science. Sarah Guthals is a three-time CSE alum (B.S., M.S., Ph.D. '10, '12, '14), and she will be teach a Special Topics CSE 190 seminar on "Teaching CS in Informal Space." The course is targeted at computer science undergraduates who are interested in teaching or building educational software, but the course will also cater to those interested in common techniques for coming up with technical requirements for particular populations. Teaching computer science to kids of all ages involves effective teaching practices, an understanding of novice programming environments, and expertise in designing and implementing engaging projects at age-appropriate levels. In her course, Guthals -- who co-created the company ThoughtSTEM and co-designed programming environments including CodeSpells and LearnToMod among others -- will teach how to create learning experiences for diverse populations. Students in the course will also learn to discover, analyze and evaluate the usability and technology behind common novice programming environments. She will also take students into local libraries and public spaces to teach kids on a project designed in the course. Guthals will also pass along some of the lessons she learned while doing research into computer science education, designing new programming environments, and starting a successful computer science education company. Another student favorite, CSE alumnus Taner Halicioglu (B.S. '96), returns in the fall quarter to teach his popular seminar course on Computer Operations and Product Engineering. Another UC San Diego alumnus, Ben Ochoa, will be teaching CSE 166 (Image Processing) in the fall quarter. He is a three-time graduate of UC San Diego (B.S., M.S., Ph.D. '99, '03, '07) in Electrical Engineering. Ochoa is the Chief Technologist at Computer Vision of Integrity Applications, Inc.
Two other lecturers also come from industry. Bryan Chin also comes from industry, where he is VP of Engineering at Onramp Bioinformatics. Chin is set to teach a graduate course, CSE 260 (Parallel Computation), in the fall quarter. He is also a former Distinguished Engineer and Architect at Cavium, Inc. And Rakesh Kumar, who is president and CEO of TCX Inc., will be teaching a seminar course in Successful Entrepreneurship in the fall quarter. Paul Cao has been teaching various undergraduate programming courses since 2015, and returns this fall to teach CSE 8A (Introduction to Computer Science: Java). Cao has taken an active interest in the CSE Tutor program and training of tutors. He also studies innovative approaches to pedagogy in his classes. John Eldon returns to the department to teach CSE 141L (Computer Architecture), a project course, this fall. In addition to teaching in CSE, Eldon has taught across campus in ECE, UC San Diego Extension as well as the Master of Advanced Studies (MAS) program. Finally, as the new major/minor in Data Science gets underway this fall, both Marina Langlois and UC San Diego alumna Janine Tiefenbruck (Ph.D. '15 in Math) will be teaching the foundational course, Principles of Data Science (DSC 10), in the fall quarter, as well as CSE 91 (Workshop in Data Science) in the same quarter. Both will also be teaching in the winter and spring quarters. CSE Ph.D. candidate Viraj Deshpande staged the final defense of his doctoral dissertation on September 20. The topic of his thesis: "Computational Methods to Study Genomic Structure and Structural Variation." Deshpande was co-advised by CSE professors Vineet Bafna and C.K. Cheng, who co-chaired the committee. Other members of the committee included CSE professor Pavel Pevzner, School of Medicine professor Hannah Carter, and Department of Pathology professor Paul Mischel, from the university's Ludwig Center for Cancer Research. With his Ph.D. behind him, Deshpande is staying in San Diego, as he begins a new career in industry as a Bioinformatics Scientist at San Diego-based Illumina, Inc. In the abstract for his final dissertation defense, Deshpande noted that "chromosomes, the carriers of genes, were first observed in plant cells in 1842. Visual inspection of chromosomes via cytogenetics laid the foundation for understanding the structure and content of chromosomes. Eventually, Watson and Creek's discovery of DNA, the building block of the chromosomes paved the way for genomics and the DNA sequencing revolution. As we lie on the cusp of scaling genomics to personalized analysis and to the broad diversity of species, the new generation of scientific discoveries relies heavily on computational analysis of complex datasets." Deshpande's dissertation highlights computational methods that he and colleagues developed for interpreting various data modalities to elucidate the large scale structure of the genome. He describes two tools, Cerulean and AmpliconArchitect (AA), which aim to interpret sequencing data in different contexts to find an unknown genomic structure. The crux of these tools is the representation of the genomic structure as a graph which encodes connectivity of genomic segments, followed by delineation of the graph into ordered genomic segments. Cerulean performs hybrid de-novo assembly of a novel genome by combining accurate, short sequencing reads with erroneous, long reads which can span longer distances along the genome. For its part, AA focuses on a specific feature of cancer genomes called focal amplifications, or regions with a high increase in copy number. These often contain cancer-causing oncogenes and undergo complex rearrangements. AA simultaneously uses short sequencing reads from the cancer genome and information from the human reference genome to predict the structure of the focal amplification. "We applied AA to comprehensively characterize the nature of focal amplifications across human cancer," Deshpande continued in his abstract. "We combined sequence analysis of AA with extensive computational analysis of cytogenetic images of cancer cells. Surprisingly, we found that focal amplification occurs through the formation of circular ecDNA structures breaking off from the human chromosomes in as many as 40% of all cancer cases. Through theoretical modeling we showed that formation of ecDNA drastically accelerates tumor growth and evolution, facilitating rapid development of resistance to targeted drugs. This defines a new paradigm in our understanding of cancer and cancer treatment." Deshpande joined the CSE graduate program in 2011 after completing his undergraduate work at the Indian Institute of Technology-Bombay. In 2013 he completed the M.S. with a depth area in Machine Learning, and continued in the Ph.D. program with research interests broadly focused on computational genomics, with specific interest in structural variations and complex rearrangements in human and cancer genomes. Early in his research Deshpande developed one of the first hybrid assembly methods, Cerulean, using short genomics reads and long PacBio reads. "The tool has been downloaded over 1,300 times even though it is not in active development," noted Deshpande in his bio. His work on extrachromosomal DNA in cancer has modifiedour understanding of tumor genome evolution, resulting in widespread coverage in the popular press and a recent commentary on the subject in the journal Science. At UC San Diego, Deshpande served as president of the Jacobs School's Graduate Student Council, the Association of Indian Graduate Students, and the Argentine Tango Club of UC San Diego. Earlier he received a Gold medal at the International Astronomy Olympiad in Beijing (2005), and took second-place in regional rounds of the ACM-InterCollegiate Programming Contest Amritapuri (2008-2009), and the Regional Mathematics Olympiad (2005-2006). CSE alumnus Tadayoshi Kohno (Ph.D. '06), now a professor of computer science and engineering at the University of Washington, is one of the authors behind a controversial new paper on "Robust Physical-World Attacks on Machine Learning Models." Kohno - an expert in computer security and privacy - and his co-authors from University of Michigan-Ann Arbor, Stony Brook University and UC Berkeley noted that "deep neural network-based classifiers are known to be vulnerable to adversarial examples that can fool them into misclassifying their input through the addition of small-magnitude perturbations." In short, they demonstrated how self-driving cars can be tricked into making dangerous mistakes with slight changes to the signs that may not be obvious to a driver on the road. As first reported in the online journal Ars Technica, their research found that by altering street signs slightly can make substantial changes in how an artificial intelligence neural network interprets the signs. Made with standard color printing or stickers, the alterations can look like graffiti or just wear-and-tear to the naked eye. Sample experimental images for the camouflage art sticker experiments at a selection of distances and angles. The placement of black and white stickers produced radically different meanings when analyzed by an AI neural net trained to view road signs under varying conditions. In the most dramatic example reported in the public but not-yet-peer-reviewed paper , Kohno and his colleagues found a Stop sign made to look like it had natural weathering, which was consistently interpreted by a neural network as a 45 miles-per-hour speed limit sign - a misinterpretation that occurred 100% of the time. Likewise, a Right Turn sign was misclassified as either a Stop or Added Lane sign in 100% of testing conditions. To analyze how AI would perceive different changes to signs, the co-authors trained their own neural network using a library of sign images because they found "no publicly available classifier for U.S. road signs." Kohno and colleagues proposed a new attack algorithm called Robust Physical Perturbations (RP2) designed to generate perturbations by taking images under different conditions into account. In the FAQ posted online in connection with the new paper, the authors noted that their "algorithm produces perturbations that look like graffiti. As graffiti is commonly seen on road signs, it is unlikely that casual observers would suspect that anything is amiss." They admit that real self-driving cars may not be vulnerable to this type of attack, but "our work does serve to highlight potential issues that future self-driving car algorithms might have to address." In a related story, according to a report in the San Diego Union-Tribune, UC San Diego "is going to begin testing self-driving vehicles on campus roads and lanes early next year, taking advantage of the fact that it doesn't need state permission to carry out such studies." The research will be undertaken by the Contextual Robotics Institute. Google tests its self-driving car. We plan to start around January, when we'll use electric vehicles to pick up mail around campus," institute director and CSE professor Henrik Christensen told the newspaper. "We may move on to delivering Amazon packages. Right now people have to come to the center of campus to get them. There's no reason we can't use self-driving vehicles to deliver things." Christensen confirmed that at least for the first round of testing, a human monitor would be located in each self-driving vehicle. But he said he was hoping researchers will go beyond have a human monitor as vehicles are proved to be safe, reliable and autonomous. Unioin-Tribune science reporter Gary Robbins also asked Jacobs School of Engineering Dean Albert Pisano about the plan. "The campus is the perfect place for us to develop vehicles that negotiate the right-of-way with people," Pisano told the newspaper. "We have more than 40,000 students and staff on campus every day, and more than 800,000 patients a year visit our medical complex. UC San Diego is a microcosm of a city. It's ideal for this kind of research." The San Francisco Chronicle published a feature article on September 5 on how "universities rush to add data science majors as demand explodes." In the article, writer Isha Salian notes that "UC San Diego is starting a data science undergraduate major and minor this fall." She also reports that "UC San Diego is creating a data science institute, funded largely by a $75 million donation this year from Taner Halicioglu, an alumnus who was Facebook's first full-time hire after its founders." UC San Diego this fall. "You launch a new major maybe once a decade, once every two decades," CSE professor Rajesh Gupta told the newspaper. "This has to last for a very long time... regardless of what's needed in the market today." Gupta chaired the CSE department during the creation of the data science program. Gupta is also reported saying that the data science program "could offset some of the overwhelming enrollment in computer science classes." The Chronicle article surveyed the state of data science education at other UC campuses as well, reporting that UC Berkeley officials are developing a data science undergraduate major that would be the first new major in at least 16 years for Berkeley's College of Letters and Science. The campus also established a Division of Data Sciences last December. Elsewhere in the UC system, UC Irvine was the first to create a data science major in 2015, and UC Santa Cruz's new D3 Research Center (short for Data, Discovery and Decisions) "pairs students with companies to work on research projects using data science skills," according to the article. However, the director of the Santa Cruz center is quoted as saying that the campus "does not plan on forming a data science major in the near future" because the campus's statistics department was opened relatively recently, in 2006. Here's a sign of the times: When it sent out a list of four "top specializations" - each containing five or six courses in the area of computer science and data engineering - the online learning platform Coursera named four sets of courses starting on Labor Day. Of those four top picks, two were created at UC San Diego, underscoring how Computer Science and Engineering faculty have become important contributors to the world of online learning and massive open online courses (MOOCs). Both of the UC San Diego specializations involve CSE faculty and partners. The Data Structures and Algorithms Specialization features faculty including CSE professors Pavel Pevzner and Daniel M. Kane, as well as occasional CSE lecturer and alumnus Neil Rhodes (M.S. '87), CSE visiting professor Alexander S. Kulikov from St. Petersburg State University, and lecturer Michael Levin, an associate professor at Russia's Higher School of Economics. The Coursera specialization was jointly created by CSE and the computer-science department of the Higher School of Economics, with support from industry partners Computer Science Center and Yandex Data Factory, where Levin serves as Chief Data Scientist. In addition to CSE_s Pavel Pevzner (below), co-creators of the course on Data Structures and Algorithms all have connections to CSE: (l-r) assistant professor Daniel Kane, visiting professor Alexander Kulikov, and occasional lecturers Neil Rhodes and Michael Levin. The Coursera specialization on Data Structures and Algorithms consists of six courses, each of them running four or five weeks. The series starts with Algorithmic Toolbox, followed by Data Structures, Algorithms on Graphs, Algorithms on Strings, as well as Advanced Algorithms and Complexity. The final course of the specialization is a capstone project based on a Genome Assembly Programming Challenge. Students learn how to assemble genomes from millions of short fragments of DNA and how assembly algorithms fuel recent developments in personalized medicine. This specialization is a mix of theory and practice: you will learn algorithmic techniques for solving various computational problems and will implement about 100 algorithmic coding problems in a programming language of your choice," according to the program's authors. "No other online course in algorithms even comes close to offering a wealth of programming challenges that you may face at your next job interview. CSE's Pevzner, who has developed more than a dozen online courses, says his team invested over 3,000 hours into designing challenges as an alternative to multiple-choice questions that are usually found in MOOCs. "For each algorithm students develop and implement, we designed multiple tests to check its correctness and running time - so they have to debug their programs without even knowing what these tests are!" he said. "It may sound difficult, but we believe it is the only way to truly understand how the algorithms work and to master the art of programming." The other Coursera top pick from UC San Diego is the Big Data Specialization, which promises to teach online students to "unlock value in massive datasets." CSE lecturer Ilkay Altintas, who is Chief Data Science Officer at the San Diego Supercomputer Center (SDSC), helped develop the six courses on Big Data with SDSC's Amarnath Gupta, director of its Advanced Query Processing Lab, and CSE alumna Mai Nguyen (M.S., Ph.D. '93, '96), SDSC's lead researcher for data analytics. Following an introduction to Big Data, subsequent courses in the series explore Big Data Modeling and Management Systems, Big Data Integration and Processing, Machine Learning with Big Data, and Graph Analytics for Big Data. The final course involves a capstone project: students are asked to build a big-data ecosystem using tools and methods from the earlier courses in this specialization. As a result of the software company Splunk having sponsored the courses, learners with the top capstone projects will be eligible to present to Splunk executives and meet the company's recruiters and engineering leadership. The first classes in the Big Data specialization will begin on September 4. The new Technology, Engineering, Arts, Math and Sciences (TEAMS) program is a new initiative of the QI-based Arthur C. Clarke Center for Human Imagination. It allows undergraduate designers, programmers, researchers, and artists to develop for augmented reality (AR) in innovative ways through interdisciplinary working groups, continuing the Clarke Center mission of fostering collaboration between the sciences and humanities. The TEAMS program offers emergent technologies normally inaccessible to advanced undergraduate groups to try new, innovative and imaginative research, paired with the tools and guidance (through graduate and faculty mentorship) to succeed. CSE students and CSE's Virtual Reality Lab in the basement of the CSE building are critical to the success of this program, because most of the same enabling technologies required for AR are the same as for doing VR -- and the VR Lab is the only one of its kind on the UC San Diego campus, with enough VR/AR setups for 35 individual users or teams simultaneously. CSE students who want to serve a mentors or trainers, as well as students who want to propose an interdisciplinary AR project, are welcome to submit proposals on a rolling basis starting this fall. All proposals will be evaluated by a committee overseen by the Clarke Center, with the TEAMS program accepting new projects as space becomes available. UC San Diego has netted the #5 spot in the UK-based Times Higher Education ranking of the globe's best public universities. The campus was named 31st overall among universities worldwide and the nation's 20th best college based on quality of teaching, knowledge transfer, international outlook and research influence. The annual report by the Times takes into account a variety of indicators. UC San Diego was able to climb 10 spots in the overall international rankings this year because of three research metrics: reputation, income and output. In addition, the campus ranked higher due to a rise in the amount of industry income it received per staff. "UC San Diego is an experimental campus-our model from day one has been focused on issues and the greater good, rather than disciplines," said UC San Diego Chancellor Pradeep K. Khosla in an interviewed with the publication featured in the rankings. "This nontraditional approach allows our students, faculty and researchers to make contributions that benefit society, and our collaborative environment among top scholars propels strengths in disciplines across the board." The 2018 Times Higher Education World University Rankings list the top 1,000 universities in the world, making it the publication's biggest international report to date. The Times states that its metrics represent key areas of higher education excellence. According to the Times Higher Education, UC San Diego's location on the Torrey Pines Mesa, which is home to major biomedical institutes, is another factor why the university performs so well in terms of industry income. The CSE Distinguished Lecture Series for the Fall 2017 quarter continues with this talk by former senior vice-president Muddu Sudhakar of ServiceNow (see full bio below). Abstract: Enterprises of all kinds are going through tremendous disruption in their business models due to unique disruptive technologies such as AI, Machine Learning, Deep Learning, Cloud. These new technologies are enabling new startups to disrupt existing large and legacy businesses. The democratization and massive proliferation of data are resulting in a massive shift in the world of AI/ML and data-driven applications. In this talk I will highlight both opportunities and challenges in building startups in the latest technology trends of AI and Machine learning. The talk will also cover how AI and ML technologies affect Value Creation in the startup ecosystem. The growing Enterprise customer needs for data-driven applications have created the need for next generation digital platforms to build these apps. AI and Machine learning are creating new requirements that developers need in the building of next-gen apps. An important aspect in this new AI/ML era is the extensive use of open source technologies, an area we will cover with emphasis on how to differentiate in an ever-growing crowded landscape discussing the trade-off of innovation vs leveraging existing technologies. My goal is to share with you several areas of opportunities to build startups and cover wide range of large opportunities to point products to solution approaches. Bio: Dr. Muddu Sudhakar is a successful entrepreneur, executive and angel investor in Silicon Valley. He is the CEO of Aisera, an artificial-intelligence startup currently in stealth mod. Sudhakar was SVP & GM of IT Operations Management (ITOM) at ServiceNow from 2016-2017. Prior to that, he was VP & GM of Big Data, Machine Learning/AI, Security and IoT at Splunk (www.splunk.com ) from 2014-2016. At Splunk, Sudhakar worked on applications of AI/Machine learning, Big data platform, Thin & Thick AI AI/ML Apps, Open source technologies, IoT Analytics solutions and Cyber Security products. Before that, he was CEO of Caspida (www.caspida.com ), a leader in next-generation Cyber Security & Threat detection using machine learning. Sudhakar and the Caspida team were instrumental in creating a new cybersecurity market category called "User Behavioral Analytics (UBA)". Earlier, Sudhakar was co-founder and CEO of Cetas (www.cetas.net ) which was acquired by VMware in 2012. He then served as VP & GM at VMware (www.vmware.com ) and Pivotal (www.pivotal.io ) for Big Data Analytics, Machine learning and Cloud Services from 2012 to 2014. From 2003 to 2010, Sudhakar was CEO & Founder of Kazeon (www.kazeon.com ), which was acquired by EMC (www.emc.com ). He led Kazeon to be a leader in Information Security, eDiscovery, and Enterprise Search markets within the Enterprise Information Management sector. At EMC (www.emc.com) Sudhakar was Chief Strategy Advisor, VP & GM for Cloud Information Services. Before Kazeon in 2003, he was Co-founder & President of Sanera Systems, a next-generation SAN technology company. Sanera was started in 1999 and was acquired by McData (Brocade) in 2003. From 1996 to 2000, Sudhakar was lead architect and designer of CPU and server technology at Silicon Graphics, Inc.
Dr. Muddu Sudhakar holds Ph.D. and M.S. degrees in Computer Science from University of California, Los Angeles and a B.Tech. in Electronics & Communications Engineering from Indian Institute of Technology, Madras. He is widely published in industry journals and conference proceedings and has more than 40 patents in Cyber Security, Big data analytics, Machine learning, Analytics, Cloud Services, SaaS Apps, Enterprise Search, Information Management, Distributed systems, Storage technologies, SAN/NAS, Server technologies, Virtualization, Search, Information security, Networking technology and VLSI chip design. This seminar is part of the CSE Distinguished Lecture Series, and it will feature three young CSE faculty: Nadia Polikarpova, Sicun (Sean) Gao, and Deian Stefan. (l-r) CSE assistant professors Nadia Polikarpova, Sean Gao and Deian Stefan will jointly present research on automated reasoning for software and systems quality and security. Nadia Polikarpova is a new hire as Assistant Professor in the Computer Science and Engineering department. Previously she was a postdoctoral researcher at the MIT Computer Science and Artificial Intelligence Lab, interested in helping programmers build secure and reliable software. She completed her PhD at ETH Zurich. For her dissertation she developed tools and techniques for automated formal verification of object-oriented libraries, and created the first fully verified general-purpose container library, receiving the Best Paper Award at the International Symposium on Formal Methods. During her doctoral studies, Polikarpova was an intern at MSR Redmond, where she worked on verifying real-world implementations of security protocols. At MIT, Nadia has been applying formal verification to automate various critical and error-prone programming tasks. Sicun (Sean) Gao is also a new hire as Assistant Professor in the CSE department. Prior to UC San Diego, he was a postdoctoral researcher at the MIT Computer Science and Artificial Intelligence Lab. Gao develops design automation techniques for cyber-physical and AI systems. His thesis work established the foundation for an algorithmic framework for the design and analysis of highly complex cyber-physical systems, for which he received his PhD in 2012 with honorable mention for the Carnegie Mellon School of Computer Science Distinguished Doctoral Dissertation award. He subsequently devoted his postdoctoral research to the implementation and application of the framework as a practical tool named dReal. The tool has now been used in over 20 research groups across academia and industry, such as for designing autonomous cars at the Toyota Research Institute, and for a personalized treatment for psoriasis that will soon enter clinical trials at a UK hospital. He is a co-PI of the NSF Large CPS Grant "Compositional, Approximate, and Quantitative Reasoning for Medical Cyber-Physical Systems." His work received a silver medal for the Godel Research Prize Fellowship from the Kurt Godel Society. Deian Stefan is an Assistant Professor in the CSE department at UC San Diego. He is also the Chief Scientist at Intrinsic (formerly GitStar), a web security startup he co-founded. Stefan's research interests are in building principled and practical secure systems. More broadly, he is interested in research that spans systems, security, and programming languages. He works on several systems, including COWL, a browser confinement system designed for modern web applications, Hails, a security-centric framework for building web platforms, LIO, a dynamic information flow control system, and ESpectro , a security architecture for Node.js. At Intrinsic, Stefan puts much of this research into practice by building systems, tools and languages that ultimately make it easier for developers to build and deploy web applications with minimal trust. Stefan completed his Ph.D. in Computer Science at Stanford, and did his undergraduate and Master's degres at Cooper Union in Electrical Engineering. He remains interested in hardware architectures, especially in the context of security. Finally, a reminder: Deadlines are looming for students who may want to sign up to participate in this year's SD Hacks hackathon in RIMAC Arena October 20-22. Registration will close on Sunday, Oct. 1 for non-UCSD students, and Sunday, Oct. 8 is the last day when UCSD students will be able to register. If you want to participate in SD Hacks 2017, register here ASAP. 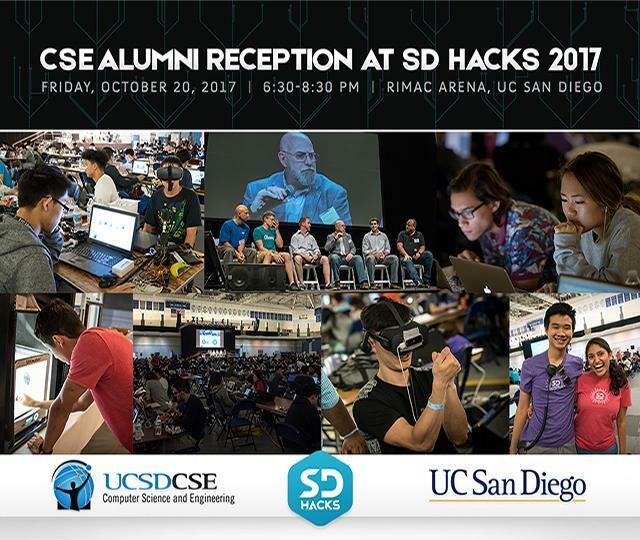 Another looming deadline is Friday, Oct. 6: that's the cutoff date for CSE alumni who want to attend (free of charge) the CSE Alumni Reception on Oct. 20, the first day of the SD Hacks hackathon. The reception will also take place in the RIMAC Arena. 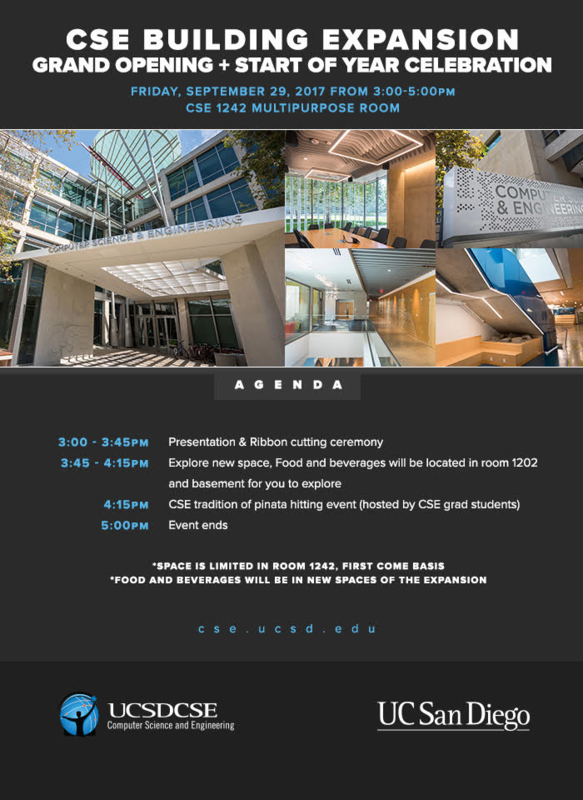 UC San Diego Computer Science and Engineering invites our alumni to attend the CSE Alumni Reception in connection with the SD Hacks 2017 hackathon. In addition to inviting you to join us at this alumni networking event, you are encouraged to volunteer as a mentor for SD Hacks, a UC San Diego student-run event: https://www.sdhacks.io/. Appetizers, desserts and beverages will be served. Casual business attire is suggested. This exclusive event is open to CSE alumni only and there is no charge to attend. Take the CSE Alumni Survey. It only takes a few minutes. We'd really like to hear from you!